The Animal Kingdom's Greatest Enemy? King Midas is remembered in Greek mythology for his ability to turn everything he touched to gold. Rick Berman, the public relations operative who's been hired by corporate interests to perpetuate animal cruelty, coal-fired power plants, and mercury in fish, amongst other ignoble causes, seems to have the opposite effect. Now, more than ever, whatever he touches turns to stone. Through the years, Berman has fought for tanning beds and now they are taxed. He's fought against bans on smoking, and now there are more no-smoking signs at more places than you can count – from restaurants to office buildings to airplanes. He's had no lasting successes with his efforts to defend seal clubbing, veal crates, puppy mills, or the confinement of hens in battery cages. And his signature campaigns defending confinement of sows in gestation crates and the use of elephants in the circus are the latest examples of just how ineffective he is. On the issue of gestation crates, Berman, often described by reporters as someone representing "restaurants and food retailers," has pretty much failed at everything he's touched. 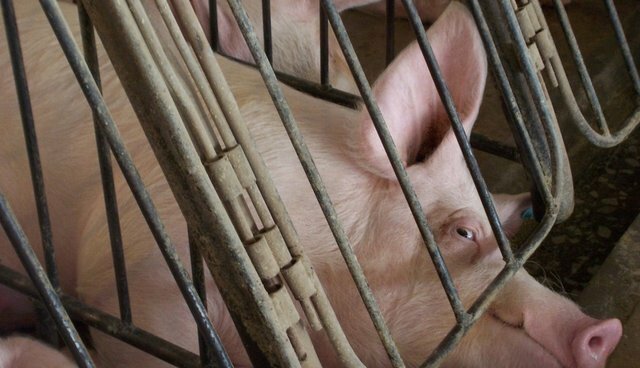 Within the last three years, when Berman has been most active on the campaign – appearing in the United States and in Canada at pork industry events and dubbing the crates "maternity pens" – almost every major food retailer in these countries has agreed to phase out gestation crates for pigs. The rip tides against crates started with McDonald's agreeing to phase them out, in February 2012. Since then, Burger King, Costco, Safeway, Kroger, Cracker Barrel, and just about every other big name in food retail has gotten on board, making public pledges to phase out the crates. In Canada, the seven largest food retailers got on board, and then the government of Canada banned the installation of new crates as of 2014 and pledged a complete phase-out of the crates within a decade. Even in New Jersey, where Governor Chris Christie vetoed an anti-crate bill that had nearly unanimous support in the legislature, it was clear that the governor was pandering to some pork farmers in Iowa and not listening to Berman. Meanwhile as the debate over Christie's veto played out, Jon Stewart, Chris Hayes, and other pundits throughout the nation ripped into Christie and reinforced the message that the crates have to go. Even The Des Moines Register said a similar thing. And almost every big-name newspaper in the United States has panned the crates. Last Thursday, Ringling Brothers announced that it would phase out the use of elephants in traveling acts. Berman had made defending the traveling elephant acts a crusade, and last week's announcement had to be a bitter pill for him to swallow. Indeed, he appeared to be caught off guard as much as anyone else by the Ringling announcement. Last week, one of his employees wrote a string of embittered letters to newspapers across the country, blaming animal advocates for Ringling Bros.' "startling" decision. Since the Ringling announcement, opinion makers around the nation have weighed in against animal cruelty or deprivation. There have been no lamentations about the end of this era. The Boston Globe called the move "terrific news for a majestic species of animal" and "a triumph of public awareness," while the New York Times said "these magnificent creatures deserve better than being dolled up and sent on the road to do stunts." The Dallas Morning News said, "`The Greatest Show on Earth' is soon to be even greater because Ringling Bros. and Barnum & Bailey Circus says it will end elephant performances." Ringling's hometown newspaper, the Sarasota Herald Tribune, said, the decision on retiring the elephants "represents the evolution from the old circus to the new." If Berman is a public relations operative, he's not just lost the fight for the hearts and minds of Americans – he's been trounced. If he's a lobbyist, he's seen corporations and lawmakers and entire nations reject his thinking and embrace reform time and again. This past week, we saw countless Americans trek down to Selma to commemorate the site where so many brave people fought for civil rights, despite oppressive efforts by the state and private mobs to deter them. In America today, those fighting reform don't brandish batons and attack dogs as they used to. Rather, they set up phony front groups and hire public-relations mercenaries like Berman who try to deny that climate change is real, that smoking is bad for you, and that animal cruelty matters. Good ideas in our society have triumphed time and again. With last week's Ringling announcement, we can see the future of animal protection more clearly than ever. It's a world where consumers, businesses, and lawmakers pay attention to animal welfare, treating other creatures with mercy. There will always be Rick Bermans in the world – there always have been. But they have always represented – whether their targets were the movements against slavery, child labor, women's suffrage, or civil rights – the most reactionary and retrograde elements of our society. We have a lot of hard work ahead of us to give animals the protections that they deserve, but we ought never forget that progress is being made at an extraordinary pace and that goodness should in the end triumph over greed and ignorance – and even over the most well-financed public-relations operatives.